At first towards virtue, and now towards the celestial luxury. To encourage people to give alms, Saint John the Merciful used to say that once some poor men were warming themselves in the sun, and they began to talk about those who gave alms, praising the good and reviling the bad. Among them was the tale of the Scrooge-like conversion of Peter the Tax Collector. There was a certain Peter, a tax-collector, very rich and powerful but utterly pitiless towards the poor. He was from Constantinople and had been appointed by Emperor Justinian (527-565) to administer the Roman province of Africa. Harsh and without an ounce of compassion, he became known to all as "the Miser". When the poor came to his door, he drove them away angrily, and not one of them could be found who had ever had an alm from him. Then one of these men said: “What will you give me if I get something from him today?” They made a wager, and he went to Peter’s house and begged for an alm. Peter came home at that moment and saw the poor man standing at his door. Just then his slave was carrying some wheaten loaves into the house, and Peter, finding no stone to throw, snatched up a loaf and hurled it angrily at the beggar. The man caught it and hurried back to his companions, showing them the alm that he had received from the tax-collector’s hand. 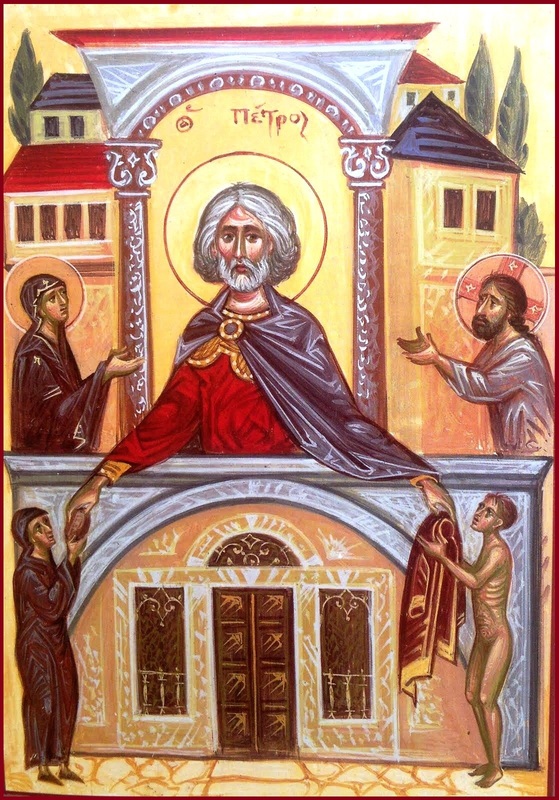 Peter came to himself, began to bless the poor, and said: “As God lives, I will not die until I have become one of them!” He therefore gave all he had to those in need, then called in his notary and said to him: “I’m going to tell you a secret, and if you breathe a word of it or if you don’t heed what I say, I’ll sell you to the barbarians!” Then he gave him ten pounds of gold and said: “Go to the holy city [Jerusalem] and buy goods for yourself, and sell me to some Christian stranger and give the proceeds to the poor!” The notary refused, and Peter told him: “If you don’t listen to me, I’ll sell you to the heathens!” So the notary took him as one of his slaves, clothed in rags, to a silversmith, sold him for thirty pieces of silver, took the money, and distributed it to the poor. Peter, now a slave, did the most menial work, and was treated with contempt and pushed and struck by the other slaves, who even called him a fool. The Lord, however, appeared to him frequently and consoled him, showing him the clothing and other gifts given to the poor. Meanwhile the emperor and everyone else bemoaned the loss of so valuable a man. Then some of his former neighbors came from Constantinople to visit the holy places and at one point were invited by Peter’s master to be his guests. While they were at dinner, they whispered to each other: “That servant looks like our friend Peter, doesn’t he?” As they stared at him curiously, one said: “It certainly is Peter, and I’ll get up and hold him!” But Peter sensed what was going on and got away. The doorman was a deaf-mute who opened the door only at a signal, but Peter ordered him to open, not by signs but by speaking. 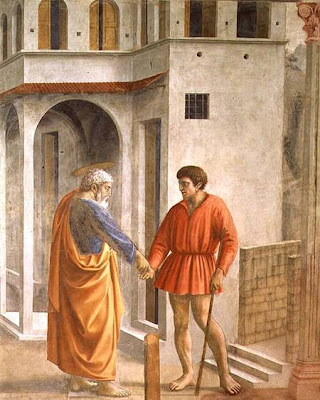 The man heard at once and received the power of speech, answered Peter, and let him out. Then, going into the house, he said, to the surprise of all who heard him speak: “That slave who worked in the kitchen has gone out and run away, but wait! 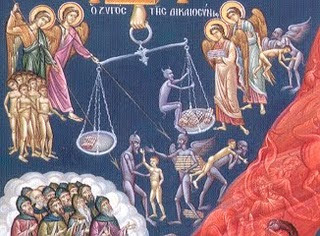 He must be a servant of God, because when he said to me, ‘I tell you, open!’ a flame came out of his mouth and touched my tongue and ears, and right away I could hear and speak!” They all jumped up and ran after Peter, but could not find him. Then everyone who belonged to that house did penance for the vile way they had treated so good a man. Everyone went looking for Peter, but their searches were fruitless. The Saint had gone into hiding, and nothing further was heard of him until his death, though it is said that he returned to his former home in Constantinople and reposed there.